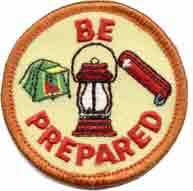 The motto of the Boy Scouts is “Be Prepared” and a big part of Scouting is outdoor activities. Different types of outdoor activities require different equipment and preparation. We’ve created several pages here that you can use as reference to better understand some of the types of gear you should consider for different types of trips. Here’s a good short video for parents to watch that talks about the big three pieces of gear: Backpacks, Sleeping gear and Tents. Typical camping gear is listed in the scout handbook. 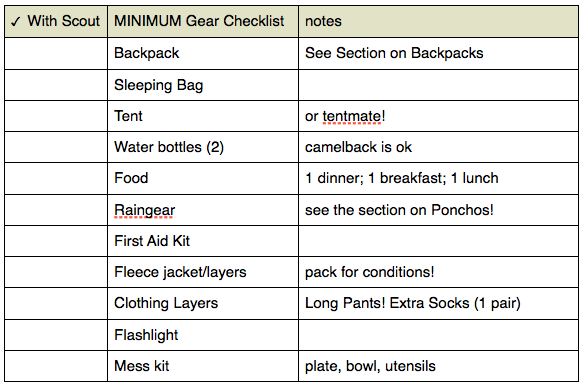 When planning to go on a trip take a look at the weather forecast to determine the types of clothing and gear you are going to need. Be sure to pull up the LOCAL weather for the location you will be at as it may be different weather than at your home. The purpose of hiking & backpacking trips is to help the Scouts to become familiar with the gear use for hiking and backpacking in general and to learn some valuable outdoor skills. Be Prepared! In order to accomplish this, some advanced preparation is required. The most important thing Scouts and parents can do is to pack the gear the night before the trip so you know what kind of equipment you have and where it’s located before you leave on your trip. Seasoned backpackers travel at approximately 2-3 miles/hour. First time backpacking would bring that down to about 1 – 1.3 mile/hour and this off course depends upon terrain (elevation change) and weather. The ideal situation is to put on the backpack, hike into camp during daylight hours and then set up camp. Scheduling for the trip starts by working backwards from a key milestone of the activity. The most important milestone is determined by Sunset on the date of the trip: tents, dinner and all preparation for the following day must be completed by Sunset. Travel to Trailhead: Depending on how far you have to drive to the trialhead is an important consideration in how much and how far you can hike or backpack once you arrive. Plan on 1-3 hours. Gearing up at the trailhead: Getting you gear on can take anywhere from 15-45 minutes depending on how may Scouts are participating and how PREPARED they are . 3-4-5 hours hiking. Each mile of the hike IN is going to take about an hour. If we need to hike 3 miles that’s going to be about 3 hours. The key to keep in mind is preparation. The more prepared the less the time it takes to complete. Backpacking as a group requires proper safety. Everyone has a different pace and there should be a good number of “breaks” built into the trip to remove and readjust gear, take care of any ‘hotspots” (so blisters don’t form), hydration, etc. Traveling in rougher terrain like wet mud or rain is going to slow everyone down: keeping the equipment DRY is the going to be of utmost importance. Generally, many hikers and backpackers take 10 minute break about every hour.